Automatic updates are convenient, as you do not have to handle the updating process of applications manually. Instead of having to stay in the loop, to know when updates become available, to download and install them when that happens, the process is handled by the software automatically instead. That's great for users who do not test updates before they land on the system, but if you prefer to take update for a test ride before you load them on productive systems, you may want to block automatic updates to do so. There are also situations where you do not want a program to update anymore. A common example is uTorrent which was purchased by BitTorrent Inc years ago. Some users are still running the latest version of uTorrent that got released before the acquisition and will not update that version ever again. There are other examples: you are on holiday and have to pay outrageous fees for Internet, or have a slow Internet connection in a cabin in the woods, or have a presentation the next day and want to make sure that the computer configuration does not change until then. We have reviewed the program before here on Ghacks, but the latest update introduces several new options for you to explore. You have two options to configure the automatic update feature of software on your Windows PC. You can either make changes to programs individually, which requires you to know where you have to do so, or, use the free portable program Update Freezer instead. Update Freezer displays a list of programs that use automatic updates on start up. The program is listed on the left, and the current state of the feature on the right. It supports Adobe Acrobat & Reader, Apple, Adobe Flash, Firefox, Google, Java, Skype and Windows. Disabled is always an option, which prevents the program from updating automatically. Depending on the program, you may get additional options. For Skype, you get the option to only install major new updates, and for Apple, you may select if you want to perform checks daily, weekly or monthly. If you want to block all automatic updates, click on the disable all button at the top. This sets them all to disabled so that you won't be bothered anymore. It is still important to update those programs regularly, especially when security updates are released or when updates include security related fixes as it remains vulnerable otherwise. You can check for updates manually in most programs though and update applications this way instead. 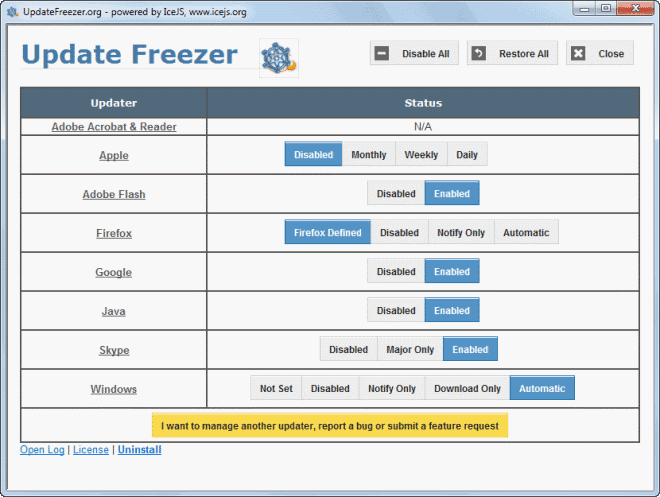 Update Freezer is a nice to have program for users who either switch the state of automatic software updates on their systems regularly, and users who want to control everything from a single interface for convenience. The program does not use any system resources when it is not running, nor does it modify the system in any way other than flipping switches that control the selected program's auto update feature.